Wellington, Fla. – Jan. 16, 2017 – As the Joe Barry tournament continued at the International Polo Club Palm Beach on Sunday, La Indiana and Mt. Brilliant won their respective matches. La Indiana defeated Goose Creek 12-10, and Mt. Brilliant took a 12-9 victory over Postage Stamp. In what seems to be a trend for the team, Mt. 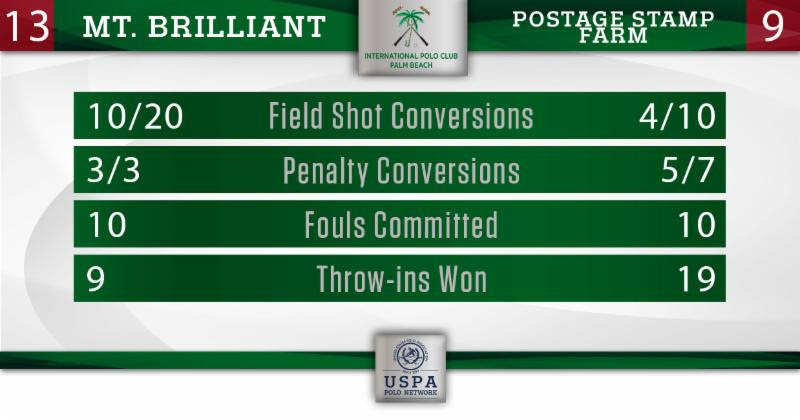 Brilliant came out firing in their quarterfinal matchup against Postage Stamp Farm. Mt. Brilliant scored four goals in the opening chukker to take an early 4-0 lead, scoring three from the field and adding one from the penalty line while preventing Postage Stamp Farm from even shooting once from the field or penalty line. 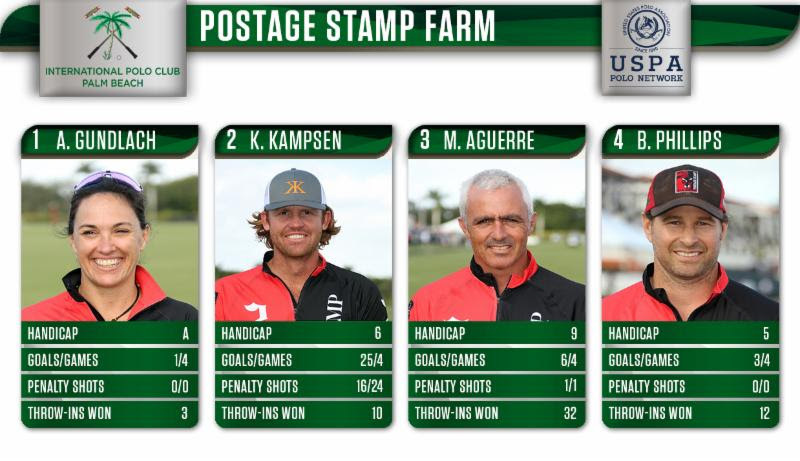 Postage Stamp Farm fought back in the second chukker, scoring one goal from the field and adding two penalty goals from Kris Kampsen. A little bit of foul trouble in the fourth chukker allowed Kampsen to make two more penalty shots, but the Mt. 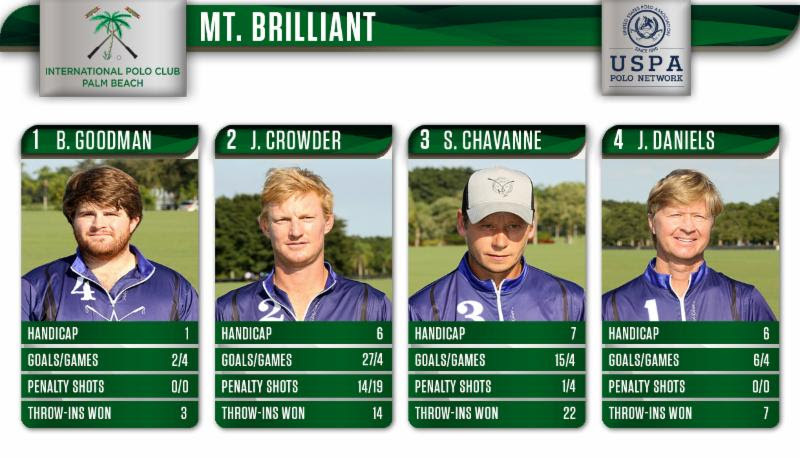 Brilliant team was all over their opponents in open play, allowing the Postage Stamp Farm team to generate only 6 shots on goal through five chukkers Mt Brilliant shot at goal 18 times through five chukkers, converting 9 of them. Down 6 goals heading into the final chukker, Postage Stamp Farm tried to make a late push, but it wasn’t enough to close the gap and the Mt. Brilliant team booked their place in the semifinals. Mt. Brilliant was very effective all day by having all of their players on top of their games, making it very difficult for their opponents to contain every scoring option. Tournament goal leader Jason Crowder had four goals on the day, while Julian Daniels added three goals and Santiago Chavanne added six. The combination of those three players, with Bo Goodman pushing the team forward, has been very effective throughout the tournament and led to Mt. Brilliant producing a tournament-high 50 goals through 4 games. In the first chukker, fouls were the story for the La Indiana team as they committed 5 fouls in the first chukker, giving Mariano Gonzalez two early penalty goals and an early lead for his Goose Creek team. Goals from Jeff Hall and Mike Azzaro at the end of the first tied the game in what turned out to be a back-and-forth affair. The game turned into a penalty shot battle between Mariano Gonzalez and Mike Azzaro with a combined 21 penalty shots, due to a total of 34 fouls in the game. With only 3 field goals combined between the two teams in the first half, the second half was going to be determined by which team could avoid fouling. The fourth chukker was very close, with patron Michael Bickford adding a goal for La Indiana. 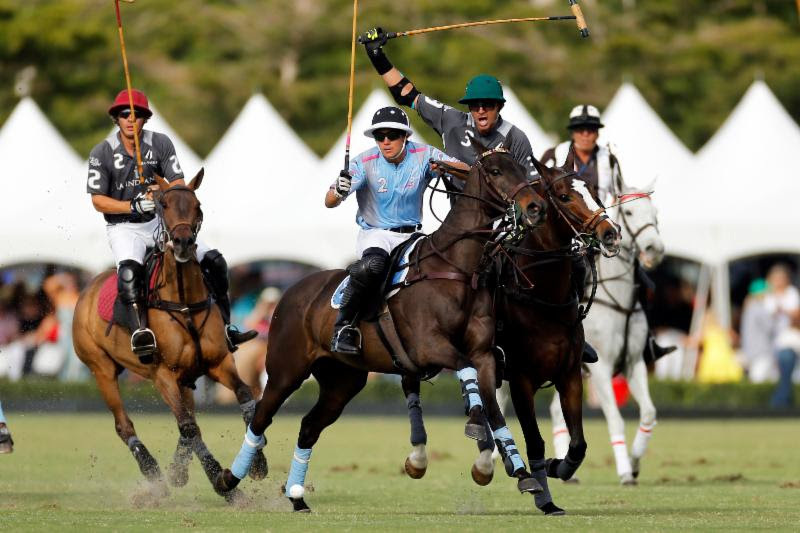 Another penalty goal from Gonzalez as well as a penalty 1 goal for Goose Creek tied the game at 6 through four chukkers. During open play La Indiana generated more scoring chances, shooting at goal 14 times throughout the game, compared to Goose Creek’s 7. 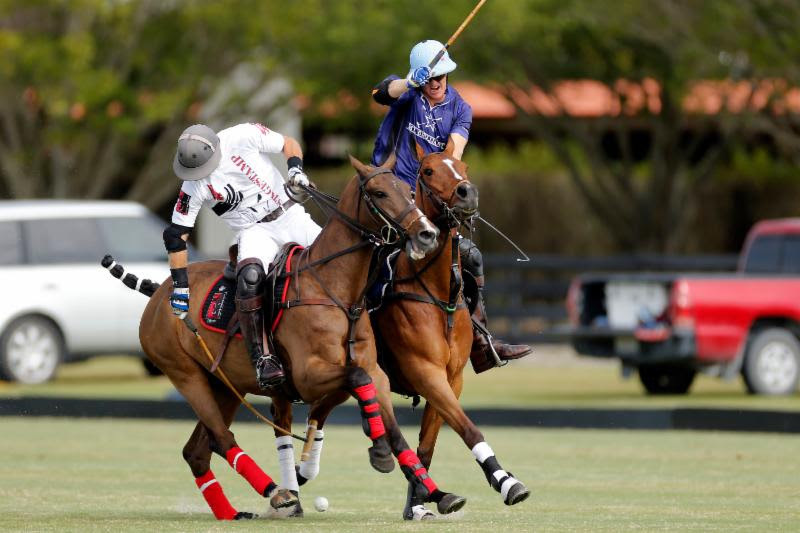 However, Goose Creek continued to place Azzaro on the penalty line, and in the final two chukkers he found his stroke, converting 4 of 5 penalty shots to put his La Indiana team ahead for good. La Indiana was strong defensively against young Peke Gonzalez, who, at 16 years old, has been a bright spot for the Goose Creek team throughout the tournament. La Indiana kept him from scoring on the day and potentially making the difference in a very close game. With the win, La Indiana advances to the semifinals. Azzaro was named MVP. Best Playing Pony went to “Azucar,” played by Peke Gonzalez. The Joe Barry semifinals take place Wednesday at IPC. Tonkawa faces La Indiana at noon, and Grand Champions-Casablanca opposes Mt. Brilliant at 3 p.m.